Not only is it the Great Ocean Road’s main surf beach, Bells Beach is also widely regarded as the overall top surf destination in Australia. A classic, easy to access surf beach an hour’s drive from Melbourne, and very close to Torquay, Bells is noted for its big Easter swells and offshore winds that grace the Rip Curl Pro surf event. Contrary to popular belief, Bells Beach was not the actual beach filmed in the surf flick Point Break, though this was a case of logistics than a betrayal of the beach’s status. When it’s up, it’s a beast; hemmed in, as it is, by high cliffs and faced by an onslaught of beefy, right and left point and reef breaks. 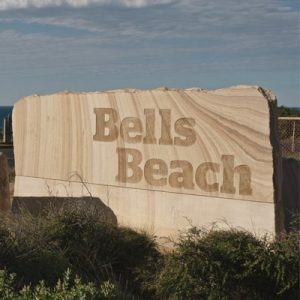 Bells Beach gets its name from one John Bell, who set up a farm in the area in the mid-1800s. Today, it is part of a reserve and a major stop-off for tourists driving the Great Ocean Road. The beach itself is not much to look at as far as beaches go, compared with, say, Bondi or Byron. And you wouldn’t come here to sunbathe either. Despite the low tide fishing potential, the main activity is surfing and there are a few different breaks, including the main amphitheatre (when it’s up) and around the headland. The surf is great when over 1.5m, but you’ll need to get into the headland on Rincon when it’s under this height. Smaller breaks are also around the headland, with a left break at Southside and a right at Centre Side. When it does kick off, Bells Beach is only meant for accomplished surfers, with its exposed reef and #6 hazard rating. The best surfing at Bells Beach is in the autumn, followed by the chilly winter. Getting in from Torquay and Jan Juc is easy as it’s really close. There’s plenty of parking here and some super lookout points, together with some facilities. Most visitors staying overnight find a hotel in Torquay or Jan Juc.